The avalanche danger is MODERATE on all aspects near and above treeline (above 2,000'). 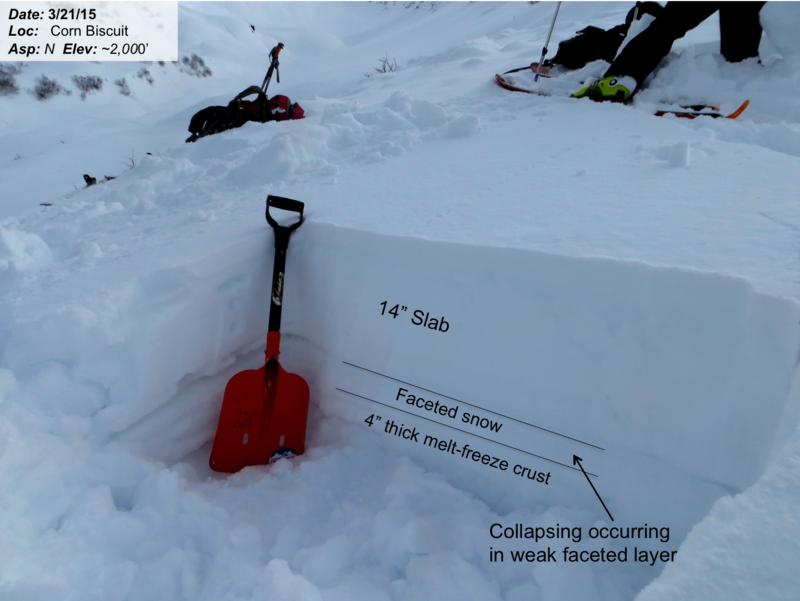 Slabs up to 3' thick resting on weak faceted snow may be triggered by the weight of a person in isolated areas. Additionally, daytime warming and spring-like conditions will increase cornice sensitivity and the potential for wet avalanches late in the day on Southerly aspects. Getting out in the backcountry to enjoy the next few clear sky days? Consider participating in this very interesting research project: "Understanding Travel Behavior in Avalanche Terrain: A Crowdsourced Approach". Researchers from Montana State University are looking for information worldwide and we can help provide some valuable AK data! Variability continues to be the theme of this weekend's snowpack. Slabs 1-3 ft thick that formed over the past week rest on a variety of surfaces. In some places the slab is bonded well to what is below, while in others it sits on a layer of facets that still have the potential to propagate and avalanche. Where do the pockets of facets exist? The complexity of the current situation is trying to figure this out. You could dig in one spot and 10 ft over have a completely different structure. Some areas avalanched during the Post St. Patty’s day storm and then were covered up by the next snow on Thursday hiding the evidence and adding to the tricky nature of this snowpack. The facets may have been blown away by winds before the storms higher on the slope yet part way down the run be present and reactive. Obvious clues may not be seen, however collapsing (whoomphing) does continue to be observed in certain areas and is a sure sign that facets exist in that location (photo below). These conditions can be the type that allow multiple folks to travel down the slope before one hits the sour spot and triggers an avalanche. If you choose to go into avalanche terrain the potential of a slab/facet setup needs to considered and respected. Use good travel practices: travel one at a time, have escape routes planned and avoid trigger points and terrain traps. Be cautious on slopes 35 degrees or steeper. Cornices have grown significantly from the past week’s storms and are hazards in some areas. Warming throughout the day can make these more likely to release naturally or under the weight of a traveler. Give them a wide berth while traveling below or next to and remember they often break farther back than you expect. The extra load of a falling cornice can trigger an avalanche if there is unstable snow where it lands. It's springtime! By late in the day yesterday (~4-5pm) the snowpack below 2,000' became wet and unsupportable while the upper elevations became damp; these surfaces have refrozen overnight. Warming should be expected again today and as the snow heats up, wet loose "push-a-lanches" will be possible on steep slopes. Although it's more of an outlier, there is a chance for pulling out a wet slab in areas with poor snowpack structure basking in the sun. It was very warm and mild yesterday as thin clouds filled the skies and lowered visibility to mostly "gray bird" conditions. Temperatures reached the low 40's at 1,000' and near 32F on the ridgetops. Winds were light and variable with no precipitation since Thursday. Today, another warm day is in store with mostly sunny skies. Temperatures should reach the mid 30'sF on the ridgetops and low 40's in the parking lots once again. Ridgetop winds will continue to be light and variable. This mild spring-like weather should remain until Tuesday afternoon when a large North Pacific low develops and looks to usher in a warm, wet and windy storm. "Greenhouse effect"? Yesterday we saw what avalanche practitioners call a greenhouse effect, or "greenhousing". This is when there is a thin layer of clouds that let much of the solar radiation in but then also trap the longwave radiation, not allowing it to be released back into the atmosphere - essentially creating a blanket over the mountains which dampened the surface snow on all aspects. We may see this phenomenon again today if clouds filter in. Today's advisory is written with Aleph Johnston-Bloom, Executive Director of the Alaska Avlanche School.